In Kamal Haasan’s filmography, Sathya is an important film that can never be ignored. 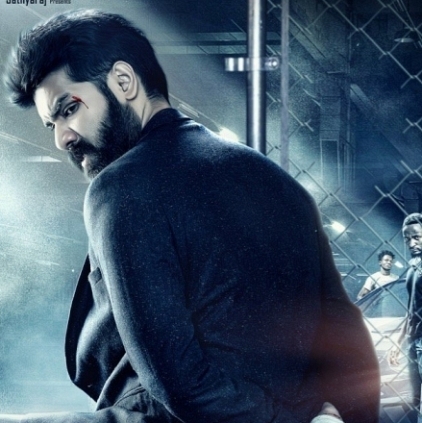 And now, this becomes the title of Sibi Sathyaraj’s next which is directed by Pradeep Krishnamurthy of Saithan fame. The unit revealed the first look yesterday (3rd February) which has been much appreciated. We catch up with Sibi. This is the remake of Telugu hit Kshanam, but of course, when we are remaking a film, few changes have to be made considering the audience and also the hero, which we have done. But the story and the screenplay are just the same. Kshanam is a blockbuster and we did not want to disturb its feel. Remya Nambeesan is the heroine and Varalaxmi plays an important role as that of a cop. Apart from them, Anandraj sir, Sathish and Yogi Babu are there in pivotal roles. We were considering many titles for the film. Since the film is entirely on the hero’s shoulders, we thought it would be apt if it gets christened as the hero’s name itself. We needed a powerful name and Sathya fitted the bill. And moreover, I am a huge fan of Kamal sir and also his film Sathya. We approached him and he immediately agreed. I am sure there must have been many heroes before me who would have asked for this title since it is an attractive one. I am very thankful to him for having given me the title. There are three tracks- two love montages and one build-up song. Simon of 555 fame is the music composer. He has done a good job and we are very happy about it. We have almost completed the film. A song and patch work are pending. The film will get ready by the end of March or beginning of April. We plan to release during the summer vacation. I am awaiting Kattapava Kaanom and within this month, you will hear an announcement regarding my next. Wishing you the best Sibi for Sathya! My Brother Arya Never Bought Me Anything When I Asked For - Now He Has Gifted Me A Movie ! People looking for online information on Kshanam, Sathya, Sibi Sathyaraj will find this news story useful.